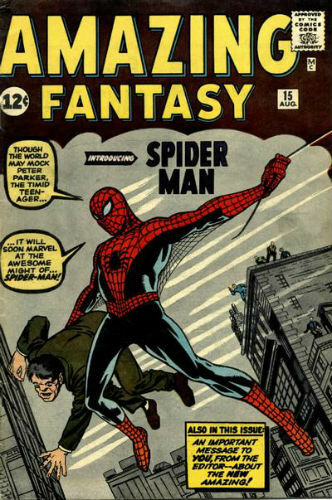 Spider-Man has been a cornerstone of the Marvel Universe since his introduction in 1962 on the pages of Amazing Fantasy #15. The Stan Lee/Steve Ditko creation was such an instant hit that, by 1963, he was the titular character in his own line of comic books and, within a decade, was featured in two separate titles, concurrently. 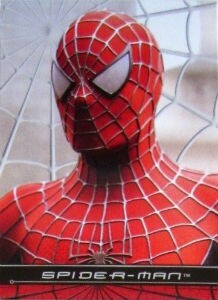 Since the 1972 launch of Marvel Team-Up, which starred Spider-Man, the character has appeared in at least two comic lines simultaneously and is often involved in crossover issues within the shared Marvel world. 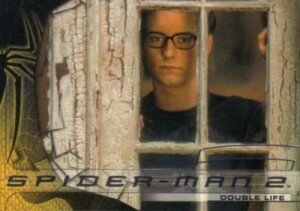 As with any popular comic book crime fighter, the teenage hero has been the subject of several movies, television shows (both animated and live action), video games, and a live-action Broadway fiasco, all of which have inspired collectibles that have focused solely on Peter Parker and his Spidey alter-ego. This guide will serve as a starting point for anyone eager to collect Spider-Man collectibles or memorabilia. Spider-Man is a revolutionary character in many ways, most notably the fact that he is a teenaged hero from a time when younger subjects were relegated to sidekick status almost exclusively. Peter Parker, though, was a relatable character for young readers who were suffering through adolescent confusion and the heartbreak that goes along with virtually every part of high school. Couple that with his wit and charm and it should come as no surprise to anybody that Spider-Man would remain a pop culture mainstay for decades upon decades. Given the sheer volume of options, this guide looks to point aspiring Spider-Man collectors to the more notable of his collectibles. Review specifics on his comics, trading cards, and figures using the tabs above. Spider-Man made his comic debut in 1962 and has been in constant publication ever since, including double publication (at least) since the early 1970s. In the grand scheme of comic book collecting, however, Spider-Man is 20+ years behind some of his DC counterparts and missed the Golden Age of comics completely. This works to the collector’s advantage by keeping the prices for early editions cheaper than those of Batman or Superman. That said, cheaper does not equate to cheap and a solid Spidey comic book collection is going to be a costly but rewarding one. The most widely available Spider-Man titles with the longest production histories are covered below. In reality, there are 15 issues of this comic book for collectors to track down. 33 years after issue 15, which premiered Spider-Man, Marvel released issues 16-18 and then began the numbering with Volume 2 in 2004. Collectors may only be interested in issue #15 with high grade copies rarely selling below $10,000, but the other issues would make for quite an addition and can be found at a much lower price. 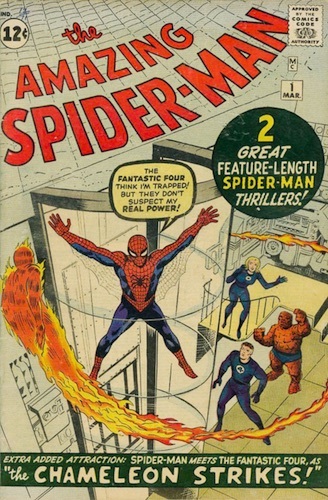 This comic was the first eponymous publication for Peter Parker and his alter ego and has been in near-constant publication since 1963. There have been four volumes, the longest of which was the 441-issue original run. A great place for collectors to begin is with issues that introduce new characters, such as the issue #3 debut of Doctor Octopus, or with the changing of creative teams such as issue #118, which was Stan Lee’s final writing credit with the series except for a short story arc over 30 years later. 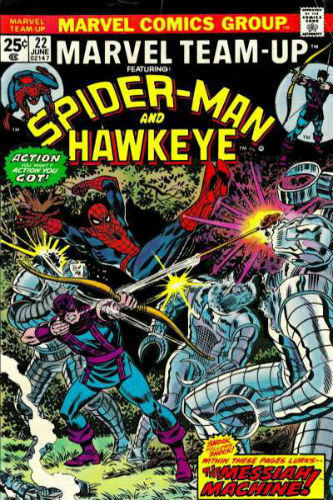 From 1972 to 1985, Spider-Man was main character in nearly every issue of the Marvel Team-Up series which combined two superheroes with every issue. There are 150 regular issues and seven annuals for collectors to track down and prices are generally reasonable on the secondary market with graded issues being the exception and selling for $100+ each. 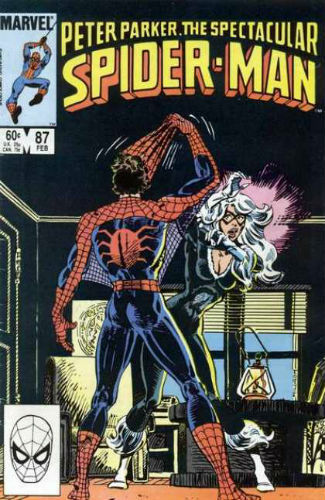 In 1978, Marvel introduced a third spider-centric title to their catalog with The Spectacular Spider-Man, which ran until 1998 and was relaunched in 2003 for a short while. The first 133 issues were titled as Peter Parker, The Spectacular Spider-Man, so collectors should begin their comic search with those early issues and work out from there. 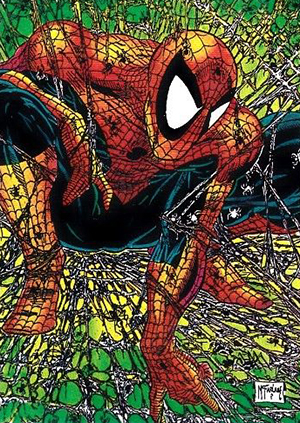 Like many comics of the 1980s and 90s, these issues have not matured a lot in value but that shouldn’t turn away collectors. Instead of looking at their lack of value now, consider the ease of entry into comic book collecting these books offer and remember that every year there are fewer and fewer issues in good condition to be found. AMAZING SPIDER-MAN #56, 1968, Marvel Comics, VF+ CONDITION COPY, DOC OCK! AMAZING SPIDER-MAN #57, 1968, Marvel Comics, VF- VF CONDITION COPY, KA-ZAR! This portion of the guide compiles the trading card sets specific to Spider-Man. As a pillar of the Marvel Universe, Spider-Man appears in several Marvel-related card sets throughout history, including the 1966 Marvel Super Heroes set that is the first release to feature many of the iconic Marvel characters. For the purpose of simplification, this guide deals specifically with traditional trading cards and doesn't include sticker sets, of which there are many. For a detailed snapshot of the top Spider-Man sets to collect, check out our take on five of the best. 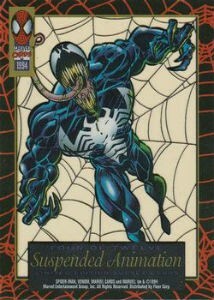 Between 1989 and 1992, Comic Images released three sets of cards inspired by the work of Todd McFarlane, the mastermind that re-energized the franchise and brought us a little character named Venom. McFarlane Series 1 and 2 combine to be a 90-card set and the 1992 McFarlane Era actually serves as the first series of their 30th Anniversary set. 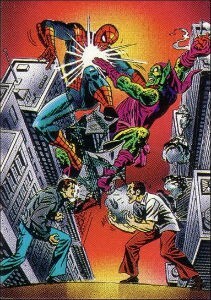 Comic Images wasn’t exclusive to producing McFarlane-based cards and released their Spider-Man Team-Up in 1990, meaning there were three different sets in comic book shops by the end of the year. They also produced a 30th Anniversary set which, in true Travelling Wilburys fashion, was issued as Volume 2 despite never having released an official Volume 1 (the first volume was actually labeled as The McFarlane Era). 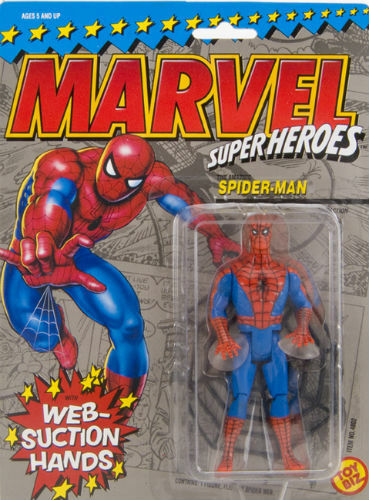 Except for his appearance in a few Marvel sets, Spider-Man had a few years of inactivity before Fleer reintroduced character-specific sets in 1995. These sets were also the first to include chase sets and are a huge upgrade in art quality and card stock. Fleer gave the character its standard treatment, Ultra treatment (twice), and Premium treatment for a grand total of 481 base cards, a full 150-card parallel set of “signature” cards and dozens of chase cards all within a two-year span. Collectors can also find a newer batch of individual Fleer Spider-Man base and insert cards that are now under the Upper Deck banner. Comprised mostly of production stills from the first Spider-Man movie, this 100-card set from Topps is high gloss and full bleed. The chase cards, by this time an expectation among collectors, were limited to a trio of five-card sets and a ten-sticker insert. With no relic or autograph cards to be had and a fairly disappointing chase set (the cards are all pretty similar and are more geared to the comic) this set is probably mostly for the die-hard or completist collectors. Although the set is named FilmCardz and was released the same year as the first film, these cards actually have nothing to do with the movie. In fact, they are so named because they are printed in the style of old projector slides. Despite the novelty and uniqueness of this set, full sets and unopened boxes are pretty easy to track down at a reasonable price but, regardless, these can be cool additions to a card collection. There are 72 base cards and chase cards which, except for the super rare autograph card, are basically different variations on border sparkle. 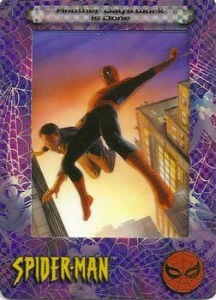 Released alongside the sequel to the blockbuster film in 2002, Upper Deck makes their debut in the Spider-Man trading card franchise with this 70-card release. This set can boast that it includes the first relic cards of any Spidey set. Alongside the Lenticular inserts, there are also Film Cel relic cards. 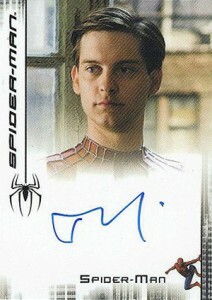 Starting in 2007, Rittenhouse took over the Spider-Man trading card releases beginning with a set commemorating the third film in the original franchise. All of their sets have limited print runs and include autographs, relics, and sketch cards, some of which are incredibly rare, incentive-based cards. In 2009, the Rittenhouse Spider-Man Archives were released and marked the first comic release in a decade. 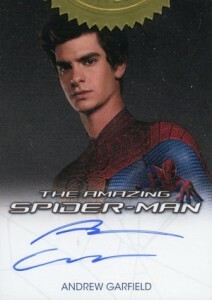 In 2012, to coincide with the reboot of the film franchise, Rittenhouse released an Amazing Spider-Man set of 17 cards (with only 444 boxes produced) and each purchaser was guaranteed an autograph by Andrew Garfield, the star of the film, as well as seven costume cards and nine character cards. It's an unconventional approach to selling trading cards but it makes these cards a hot commodity. 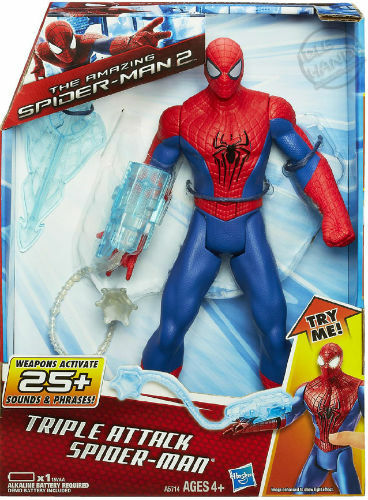 Spider-Man has been a fixture in the action figure market since its early beginnings in the 1970s and continues to be a centerpiece of many figure lines. Here is a general run-down of the figures new collectors should track down. Many figures will have variations in costume, accessory, or packaging, which may explain why the figure you’re hunting for is available at several different price points. No collector of action figures should be without some sort of Mego release as they were the first to present superhero action figures to the world. These figures come in dozens of variations as packaging and costumes were changed frequently and differed based on geographical production. This also marks the only time that Marvel and DC characters were released in the same toy lines. Be cautious of reissues and fakes, especially out of the box, and expect to pay a few dollars more for these vintage toys. Beginning in 1990, Toybiz was the manufacturer of all Marvel toys. In fact, Toybiz was partially owned by Marvel and the toys were eventually branded as Marvel toys despite being produced by Toybiz. 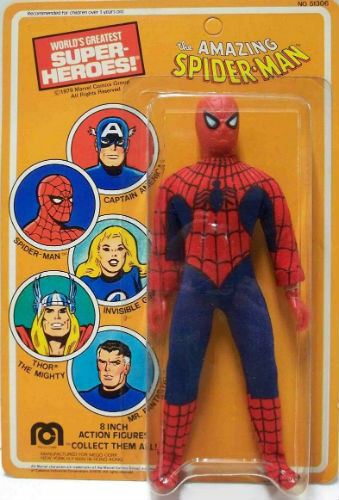 There are dozens of figure lines that include Spider-Man under the Toybiz branding, including figures based on the animated series as well as their Cosmic Defenders line. These figures, even in the box, are fairly easy to find at a reasonable price and should be a fun trip down memory lane for fans born in the 1980s as these were the toys they saw on the shelves of every store growing up. In 2007, Marvel made a deal with Hasbro which made it a violation for Marvel Toys to produce action figures based on Marvel characters. Yes, you read that correctly. Hasbro has released many action figures based on the Marvel characters and these figures remain easy to find in retail as well as the online secondary market. Asking prices on online auctions may seem a bit steep for a relatively recent release but items rarely sell for much more than retail value unless it was a short-run or retail-exclusive figure. If you’re looking for a way to get into the hobby for cheap, these may be your best bet as they are built to appeal to collectors. There are many statues of Spider-Man and his supporting cast of characters to add some artistic flair to your display case or bookshelf. From character busts by Bowen Designs to the high-end scale figures by Sideshow, each statue is an original, colorful, high-quality piece of visual art and the attention to detail, particularly on high-end statues, is absolutely stunning. By nature of his abilities, Spider-Man lends well to the statue presentation with many exciting and action-packed poses being sculpted every year like the 25” Sideshow Collectibles Premium Format figure released in 2016 (pictured below). Many of these statues are limited release and can cost several hundred dollars but they retain their value very easily and often appreciate quickly, depending on the character and release size. 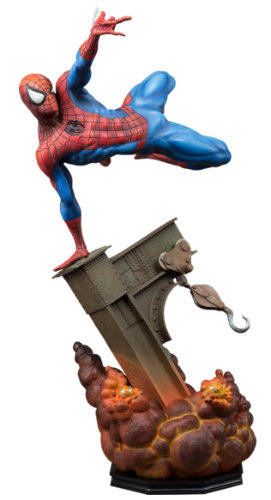 If you’re looking for a piece of art that you’ll never grow tired of looking at, Spider-Man statues are the route to go. If you are a regular reader of this site, you are very aware that Funko produces a ton of figures for a ton of franchises. 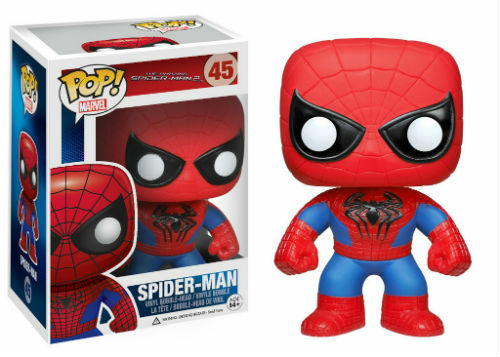 Marvel is no exception and Spider-Man is given the Pop treatment in their Marvel Universe line as well as lines devoted to theatrical releases. Funko Pop figures are typically solid at holding their value and with a mix of retail exclusives and alternative designs, some figures can sell for quite a bit over retail value. Funko Pop figures are eventually retired and with an ever-increasing selection bumping older figures off of shelves, it is not uncommon for certain figures to become very difficult to track down. While Funko may not be the most lucrative collectible on the market, it is certainly a lot of fun and something you can seek out online or in any number of retail outlets.